Here are some of my illustrations. Some are pretty weird but I like most of them. The majority are PrismaColor color pencils and a few are various media like pen & ink, graphite pencil, hard ebony pencil, and one is a gouache painting (I know it's not an illustration but I put it here anyway because it would be lonely by itself). 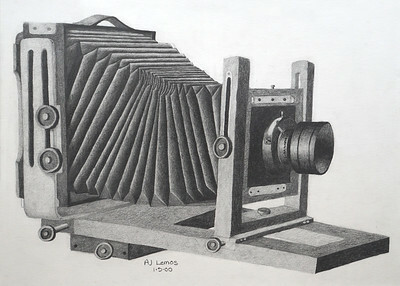 Illustrated from a 64mm range finder beveled camera in the Mendocino High School Art Room with a Hard Ebony Pencil. 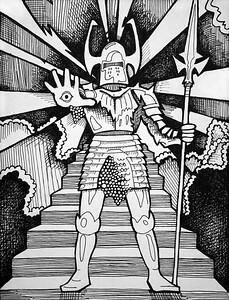 Pen & ink illustration from a painting by "DEN" in the AD&D 2nd Edition Dungeon Master's Guide. 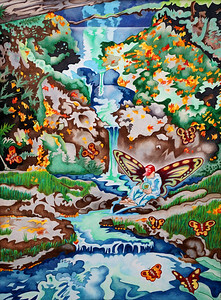 PrismaColor color pencil illustration of a waterfall in autumn with a butterfly fairy, surrounded by butterflies, holding a crystal ball with a butterfly in it. A place for frogs to be frogs. 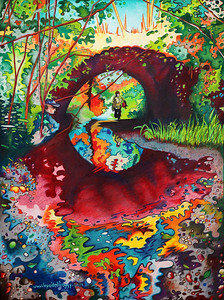 PrismaColor Pencil illustration of 2 people at a stream culvert. Drawn from a photo taken in Caspar, Mendocino. 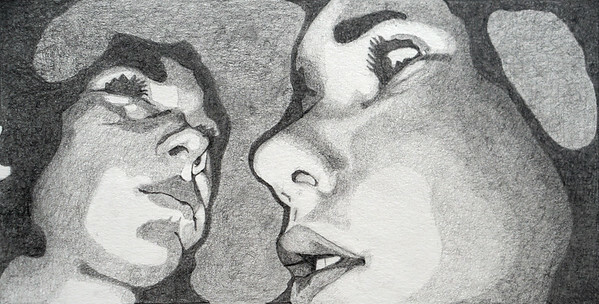 A sketch with a #2 pencil from photos of myself. 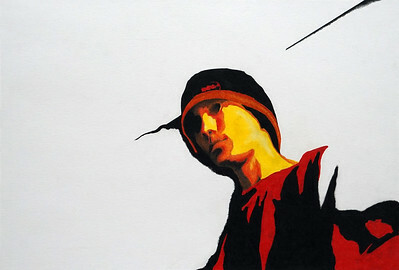 Self portrait illustration with PrismaColor Pencils. 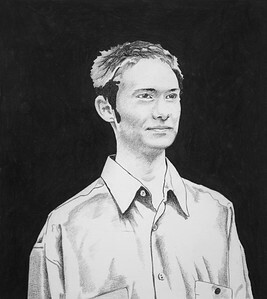 Drawn from a photo of myself in the video lab at the Mendocino High School. 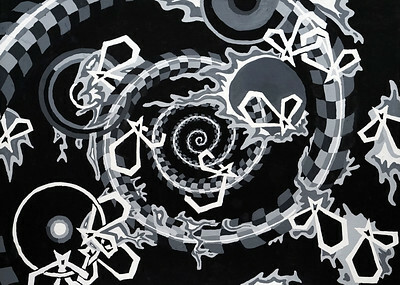 A gouache painting using re-occurring geometric shapes. 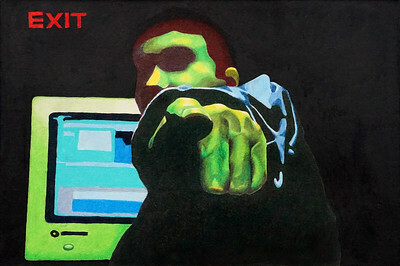 Created in 2D Design: Composition & Color at Santa Barbara City College. 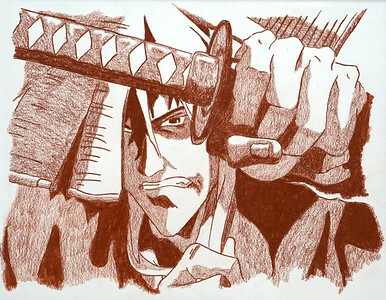 Illustrated with a single PrismaColor pencil from a still from "Ninja Scroll" (Palm Pictures/Manga Video, 1996). 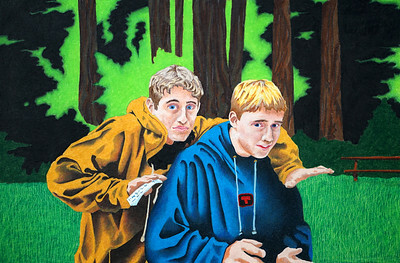 A PrismaColor illustration of my friends Laine and Trevor that I did in High School from a photo. Done with a single black PrismaColor pencil. This was used as my high school senior portrait in the Mendocino High School yearbook. 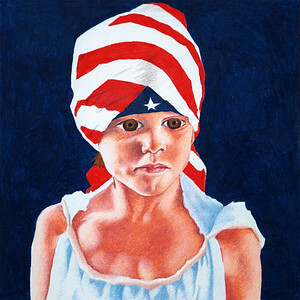 A PrismaColor Pencil illustration from a photo by Bill Brazill of my friend Erin Brazill who perfectly wrapped an American flag around her head. 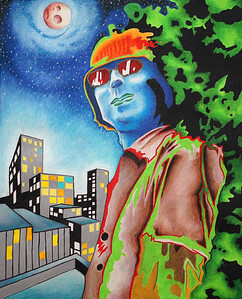 A PrismaColor Pencil portrait of Taz shifting between forest and city landscapes. A self portrait illustration with PrismaColor pencils.